Today on the Asteria’s 11am trip, we headed to the SW corner of Stellwagen, once again escaping the muggy summer heat. 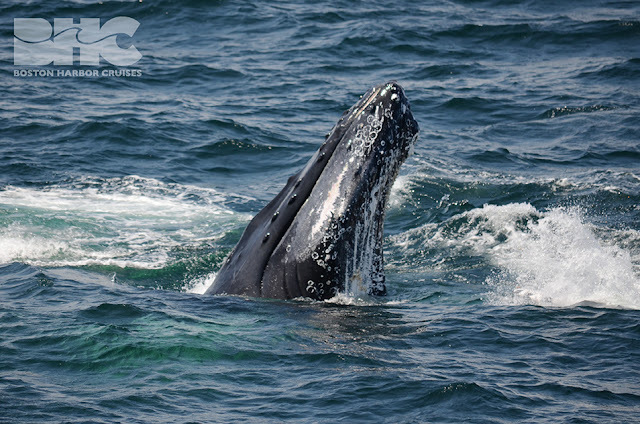 When we arrived on the bank, we first found a pair of humpbacks slowly traveling and logging. This pair did not fluke for us, and after a few looks we decided to move on to some of the other scattered humpback activity in the area. We found a group consisting of Perseid, Canopy, and Snare, most likely feeding below the surface. We got great looks of this trio alongside our boat, and then suddenly Perseid breached right next to us! (see photo). Amidst all this, we watched humpbacks Othello (aka Slugger) and Pepper and her calf pass by in the distance (they also did some tail breaching). I very much enjoyed seeing these two old veterans (Othello is a male first seen in ’78, and Pepper one of the first females named in ’76) traveling together. As if a breach next to our boat wasn’t enough, Captain Joe squeezed in some extra time for us at the end of the trip, to watch one of our unknowns of the year do continuous tail breaching, lobtailing and flipper slapping! This was a fabulous and exciting end to our trip. Something interesting we also noted on the fluke of this whale was a large chunk/stalks of gooseneck barnacles attached to it. It definitely is bizarre looking! Sometimes passengers ask us if our whale watch was a great one, but every passenger I spoke to today, especially those who had been whale watching before, told me it was the best one they’d ever been on. 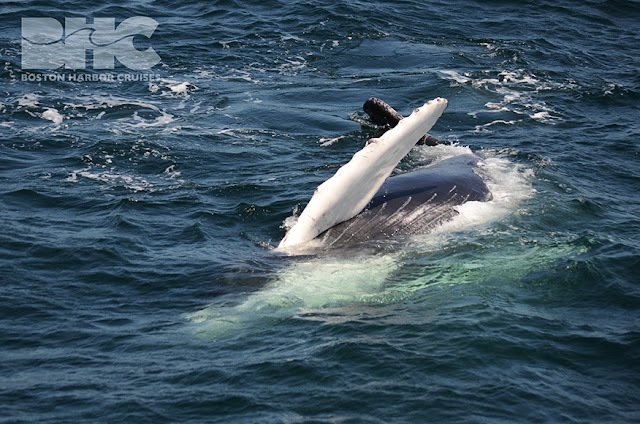 We headed out on the Aurora towards the southwest corner of Stellwagen Bank and quickly spotted two humpback whales. These soon dove and proceed to stay down for around 8 minutes. Not enthused by this performance we headed just a little ways farther on to the bank and spotted a mega group of quite a few animals. The theme of today’s sightings was quickly switching associations, fast swimming, and little fluking. 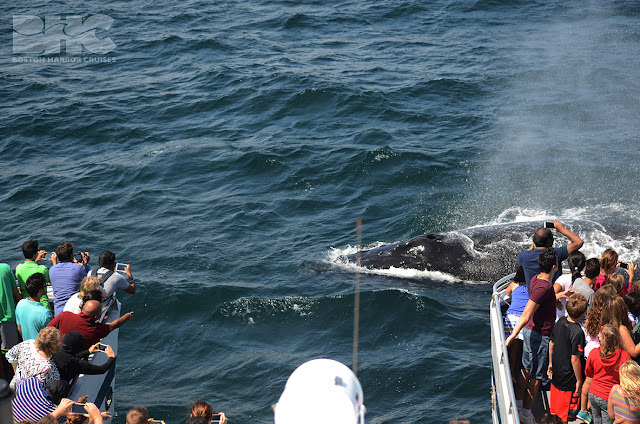 All the qualities that make for exciting whale watching but terrible data collection. Despite the odds we were able to identify around half of the approximately 20 whales in the area. All together we spotted Hancock and calf, Pele, Tear, Snare, Pereid, Colt, Jabiru and calf, and Cajun and calf. The most exciting moment of the trip came when four to five adult humpback whales swam under our bow! We got some adorable curious behavior from one of the calves and observed a great deal of social milling. I even got to see a beautiful ring bubble blown by one of the whales below the surface. Even after going on so many whale watches myself, its one I won’t forget anytime soon. Captain Jeff certainly deserved his round of applesauce.